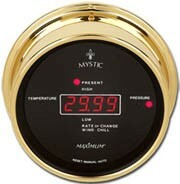 The Cabled Mystic Digitally displays both barometer readings and temperature in four different modes: Present, High, Low, and Rate of Change for barometric pressure, which shows the amount of change in inches per hour. When connected to Merlin, the Wind Chill setting will show the effect of wind speed on temperature. Features user-selectable units of measurement for temperature (ﾭC,F) and barometric pressure (inHg, mmHg). Includes: 60' Cable, Sensors, 6.5" Solid Brass Dial, AC adapter, and hardware supplied. Specify altitude if above 3000'.